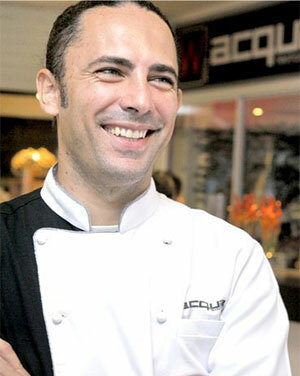 Chef Alessandro Frau is an Italian Chef and Restaurateur. Born in 1977 in Sardinia, he has grown up with the Colors and Flavors of the Mediterranean and traveled around the World learning the secrets of the World’s Cuisine. He has started his career in the City of “All Nations” London, worked in 5* luxury Hotels such as Le Meridien, continued in Italy, France, Mexico,Sweden,Finland as Chef de Cuisine, to finally settle in Thailand, firstly working at the Sheraton Grande Laguna as an Executive Chef and in 2009 has opened his own Italian Restaurant” Acqua” a true delight for the gourmands. “I Built my restaurant ‘Acqua’ which contains all the experiences I gathered travelling around the world, my conception of the perfect place in which to satisfy personal culinary needs, in an equally attentive context with a modern design. Now that I am my own boss I feel freer to create and manage my type of cuisine, my own restaurant, and to put into action what I have learnt during those years in which I traveled the world, coming into contact with different people, characteristic perfumes and smells, ingredients, objects, shapes and sensations, people and emotions… all jealously stored within me and which I can now use as I like. This was how I founded ‘Acqua’ , a modern Italian restaurant, but which does not neglect tradition and regional specialties, to give a comprehensive choice of that which is Italian cooking, in its development from that which used to be cooked by our ancestors until today, to the great chefs and cooking creativity and evolution. Although in Thailand, the restaurant has everything: customers can enjoy dishes with fresh artichokes and bottarga, burrata, culatello and fresh figs or spaghetti with sea urchins from Sardinia. This is only a small example of how I wanted to recreate the authenticity of Italian cuisine. Acqua has received many awards: The best Italian Restaurant 2012, Asia’s finest Restaurants Miele Guide 2012 award, Wine Spectator Award of Excellence and is considered one of the Top Gourmet restaurants in Thailand. We came close up and Personal with Chef Alessandro Frau to get to know him better and find out a little bit more about his Personality, Character and Spicy details about his life. After I finished school in Italy went to London to learn English, there I had to get a job to pay my school so I got my first job in the kitchen, this make me discover the passion for this job……and from then I have been following my passion till today. Calm, serious, dreamer, creative, passionate…. Emotional, I take things very seriously and sometime if things doesn’t not go as plan I feel down….. I had a very VIP function and I want to make a special presentation with oysters and dry ice, but something went wrong, so the time from the kitchen to the table and the oysters were frozen………., but now with the right modifications this presentation is one of our signature dish. Ferran Adria’, but not mainly for his food but mostly for his simple personality, for his passion for cooking and for his creativity…. If you mean local here in Thailand I love pork palo’ which is a stew of pork belly with cinnamon, soy sauce, sugar cane etc…. For International beside Italian I like a nice plate of sashimi or oysters or some good iberico ham. Hong Kong as I can get in good restaurants and the level of people it’s very high class, I live in a island all year so I look for the city for my holiday. Marco Pierre White “white hats” remind me my old times as Chef in London, was the same period of the issue…. No regrets I’m very happy with all the main decision a took!!! And everything I have done! 25 hours cooked suckling pig, wood fired roasted and served with his own sauce, fava beans, saffron and goat’s cheese mash potatoes. Chop all the herbs and sprinkle on the meat side of the pig with some salt and black pepper. After the cooking open the pack and you will have some juice from the pig, than put in a pot and make a reduction out of that. Slice the potatoes with a slicer to make a millfeuille, boil for 5 minutes the potatoes with milk and saffron. Than take the goat’s cheese melt in warm milk and make a cream, than do the millfeuille of potatoes with the goat’s cheese cream in each layer, than bake for 20 minutes at 180 degree. Cook the broad beans in a pot, with some extra virgin olive oil, lard, and chopped onions, cover with some vegetable stock and cook until soft, part of this put in the blander and make a puree and part keep whole. Compose the plate as your creativity skills suggest to you …….